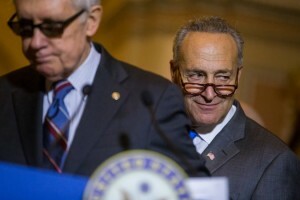 The decision by Senator Chuck Schumer of New York to oppose the Iran nuclear deal has rattled the Democratic bulwark around the accord, emboldened the deal’s opponents in both parties, and set off a wave of condemnation from liberals for the man who hopes to lead Senate Democrats in the next Congress. To scuttle the deal, opponents have two high hurdles. They will need 60 votes in the Senate for a resolution of disapproval to overcome a filibuster by supporters of the accord. If the opponents get that, the president will veto the resolution. The opponents would then have to secure the votes of two-thirds of the lawmakers in both chambers to override the veto. Mr. Schumer’s voice is powerful, and his politics are wily, but he alone cannot stop the international agreement, which Republican leaders in the House and the Senate have promised to bring to a vote in mid-September.